Mark Twain said, "My mother had a great deal of trouble with me, but I think she enjoyed it." Many players would have a great deal of trouble with this deal, but if West found the winning defense, he and his partner would enjoy it. Look at the West and North hands. South is in four spades. West leads the heart ace: five, two, jack. What should West do next? Where will he find three more tricks? 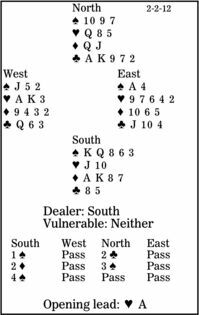 North was right to force to game on the second round of the auction, his queen-jack of diamonds having been improved by South's rebid in that suit. Then West thinks about high-card points. He has 10 and dummy 12. That leaves only 18 for East and South. East can have only one helpful card. If that is the diamond ace, the contract is probably unbeatable. But if it is the spade ace, there is a chance. West should cash his heart king and play a third round to dummy's queen. South discards a diamond and plays a trump, but East can win this trick or the next trump trick and lead a heart, which promotes West's spade jack to a winner, giving the defenders two tricks in each major.